Ed Kostecky from Masury, Ohio and Dave Peck from Warren, Ohio recently booked a fantastic Niagara River fishing trip with Grant Koppers from sportfishingniagara.com. They caught and released 12 walleyes and 6 lakers over the slot limit. The walleyes were mostly males and the biggest was 11 1/4 lbs and had a 18 1/2 in. girth. They were using spot tails minnow on a three way swivel with 1 1/2 oz. lead drop weight. This was only the second time they used Grant the first time they had three fisherman on the boat caught and released 45 lakers, this guide really knows the river and the fish that are in it. The Niagara River gets it start as the waters of Lake Erie begin to collect up and start a journey of over 30 miles draining into Lake Ontario. On the way the river is divided into the Upper and Lower stretches by the wonderful gift of nature known as Niagara Falls. The river provides a natural border between the USA and Canada. It's waters are used to generate hydro electricity and to provide water for the Erie Canal. The upper section is a fantastic fishery for perch, bass, walleye and muskellunge. Fisherman can troll with lures or drift fish with live bait. Fish will congregate where ever the current has a break in it. Any dock or pier will give up some nice bass and the occasional muskie. The upper section of river isn't as treacherous as the lower section, but its waters should still be given plenty of respect as the current is still very strong. 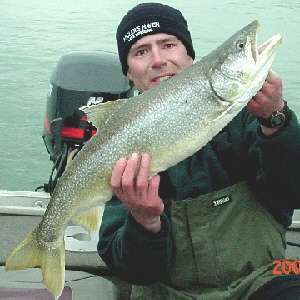 The lower section supports a fantastic fishery for steelhead, brown trout, lake trout, chinook salmon, coho salmon, bass, walleye, muskellunge, and perch. Most of the fish in the lower section of the river are from Lake Ontario, but find the waters of the Niagara River to be excellent habitat. These fish are able to go upstream as far as the falls. The Niagara River gorge is very steep and most fishing in this section of the river is by boat. 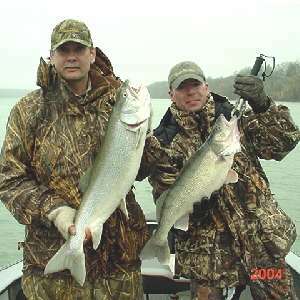 There are many guides who will be happy to show you a wonderful time on the mighty Niagara River. If you are considering a trip on the mighty Niagara River click here .